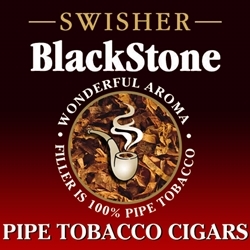 BlackStone machine made tip cigarillo cigars is a superior blend of pipe tobaccos specially created for use in cigars. This machine made cigar brand brings together the convenience of a cigar and the special appeal of a pipe. The pleasant aroma and the satisfying taste have won over a large and diverse group of cigars smokers.